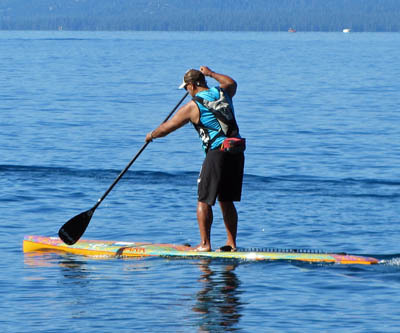 On August 31, four Stand Up Paddlers will circumnavigate the 72 miles of Lake Tahoe’s shoreline. The group hopes to complete the journey within 24 hours to promote Vegan 1 Day. Vegan 1 Day is a challenge for everyone to adopt a vegan diet for at least one day. A vegan diet is plant based. No meat, dairy or eggs are acceptable. The paddlers will begin their journey at 6:00pm from Kings Beach. There will be a vegan pot luck on the beach when the paddlers get underway. 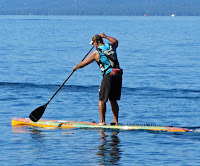 The paddlers will travel in a clockwise direction through the night under the light of a full moon. A group of cyclists will leave Kings Beach at 8:00am the following morning. The cyclists will travel in a counter-clockwise direction and hopefully arrive back at Kings Beach when the paddlers arrive. The riders and the paddlers will be eating strictly vegan during their travel, of course. You are welcome to ride with the group Saturday morning for part or all of the way. Contact John Merryfield by email: John@Vegan1Day.org.